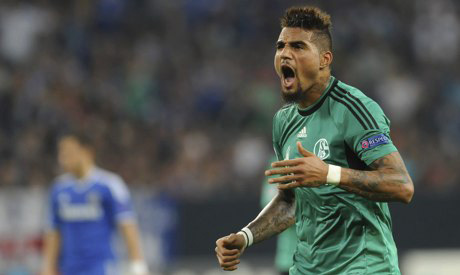 A German Football Association's (DFB) anti-doping doctor has resigned after a picture of Schalke's Kevin-Prince Boateng drinking beer and smoking while being tested for drugs appeared in a newspaper. Boateng was injured in Wednesday's 6-1 last 16, first-leg drubbing by Real Madrid -- the heaviest home defeat suffered by a German team in Champions League history. It capped an unfortunate few days for the Ghana midfielder after the picture appeared in German daily Bild earlier this week. A Bild reader had submitted the shot showing Boateng, still in his Schalke kit, blowing cigarette smoke and holding a half-drunk bottle of beer. The assistant of the doctor in charge is said to have taken the picture while Boateng was being drugs tested by the DFB after Schalke's 2-1 win at Bayer Leverkusen a fortnight ago. Leverkusen denied any responsibility as the picture was taken in a DFB-controlled area of their BayArena stadium. "The DFB has looked into the case immediately and thoroughly," the DFB's media director Ralf Koettker told SID, an AFP subsidiary. "In a telephone conversation with Dr. Rainer Koch (a DFB vice-president in charge of anti-doping) the doping control doctor admitted the wrong doing of his assistant. "He asked the anti-doping commission chairman to release him from his duties." On Tuesday, Schalke's director of sport Horst Heldt had threatened legal action over the picture. "This was taken in the player's privacy. We will fight with all means available and make an example of whoever did this," said Heldt.